In 1850, Nathaniel Hawthorne, fired from Salem's Customs House and returning to writing, reconceived his old job title, Surveyor of Customs, as his new one. Taking seriously this naming of the American author's project, Joel Pfister argues that writers from Benjamin Franklin to Louise Erdrich can be read as critical "surveyors" of customs, culture, hegemony, capitalism's emotional logic, and much else. Literary surveyors have helped make possible?-and, if we credit its critical work, can advance what we now call cultural analysis. In recent decades cultural theory and history have changed how we read literature. Literature can return the favor. America's achievement as a literary nation has contributed creatively to its accomplishment as a self-critical nation. The surveyors convened herein wrote novels, stories, plays, poetry, essays, autobiography, journals, and cultural criticism. 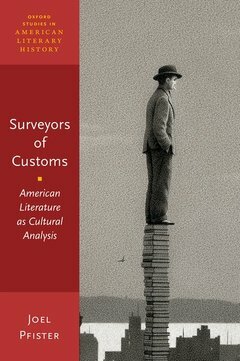 Surveyors of Customs explores literature's insights into how America-its soft capitalism, its "democratized" inequality, its Americanization of power-"ticks." Historical-and timely?questions abound. When and why did capitalism invest in the secular "soul-making" business and what roles did literature play in this? What does literature teach us about its relationship to the establishment of a personnel culture that moved beyond self-help incentive-making and intensified Americans' preoccupations with personal life to turn them into personnel? How did literature contribute to the reproduction of "classless" class relations?and what does this tell us about dress-down politics and class formation in our Second Gilded Age? Joel Pfister is Olin Professor of English and American Studies at Wesleyan University. His publications include Staging Depth: Eugene O'Neill and the Politics of Psychological Discourse (University of North Carolina Press, 1995), Individuality Incorporated: Indians and the Multicultural Modern (Duke UP, 2004) and The Yale Indian: The Education of Henry Roe Cloud (Duke UP, 2009).